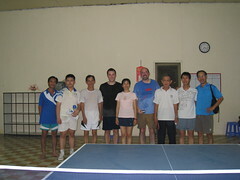 This is a picture from early in the trip, where Hai’s teacher set us up to play with the Sa Dec Vietnam Table Tennis Club in their excellent new area. During Tet they usually would not play much but opened on our behalf and we all had a fun time. I’ve really been struck by how quickly the folks in Vietnam would warm up to us and treat us like family. At our hotel in Saigon we enjoyed the honor of eating with our hotel host’s family for Tet dinner – a wonderful spread of many delicious traditional foods and toasts with cognac. Food and friends are a cornerstone of Vietnamese culture and we’ve been fortunate to experience that at many levels during out travels in Vietnam. Yokeli Americanus could use a bit of asian-izing–the good parts at least . Ping pong, schezuan cooking (make it salmon, instead of beef o pollo for the PC), bicycles, tae kwon do, other stuff. Not sure on the Booodha though. He works for Wall Street, usually.